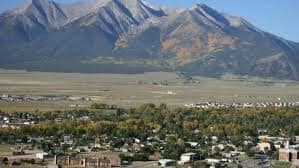 Buena Vista is located in central Colorado roughly midway between Salida and Leadville in the Upper Arkansas River Valley at an elevation of 7,965 feet (2,428 m). The area between Buena Vista and Salida is often referred to as the “Banana Belt”, due to its relatively mild winters. The term “Banana Belt” actually refers to the fact that Buena Vista lies in a wide valley and is a high mountain desert with milder temperatures than nearby communities such as those on the I-70 corridor. The town lies at the base of the 14,000+ peaks of the Collegiate Peaks, Mt. Princeton, Mt. Yale, Mt. Columbia, and Mt. Harvard, of the Sawatch Range. In summer, Buena Vista is a popular access point for world-class whitewater rafting, kayaking, and fly fishing on the Arkansas River, and mountain climbing and backpacking on local 14ers and the Colorado Trail. Sizable elk and deer herds attract hunters in the winter months, and bighorn sheep, mountain goats, and antelope are also indigenous to the area. Buena Vista incorporated in 1879 and grew as a railroad town serving the local silver, gold, and lead mining industry, with three rail lines including the Denver & Rio Grande, South Park & Pacific, and Colorado Midland railroads. Many of the existing buildings of Buena Vista date back to this era, and were built in the 1880s and 1890s.